When you are looking for a reliable, quality fabricator for custom stairs, you can trust the team at TITAN Industries, Inc. We strive to produce nothing but outstanding custom products for our clients. We work with several large corporations and organizations in Illinois, so we understand that you need your product on time and on budget. TITAN offers several material choices, including carbon steel, stainless steel, or aluminum. For more information and pricing, contact TITAN Industries, Inc. at (309) 440-1010 today! Carbon steel stair units are incredibly strong and versatile. Our TITAN Industries, Inc. stairs are repeatedly graded as exceptional. The treads on our carbon steel stairs provide the recommended grip that passes all safety and regulatory codes. We have several starting designs available and are more than happy to sit down and discuss your particular needs. Stainless steel is well known as a great choice for custom stairs for commercial and even residential use. Stainless steel is light, strong, and attractive. For many customers, they rely on stainless steel stair units to protect their employees, while ensuring that their staff can access what they need to in a quick and timely manner. 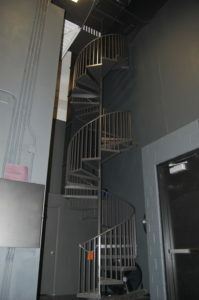 TITAN Industries has a well-known reputation for producing premium quality stainless steel staircases. When you need an incredibly lightweight, durable, and non-corrosive metal staircase, aluminum is one of the best choices on the market. Primarily used where water threatens to corrode and rust any other material, aluminum is a fantastic choice. Our quality aluminum stairs can be designed to fit any unique specification. Our experienced staff can assist you in the customization process.